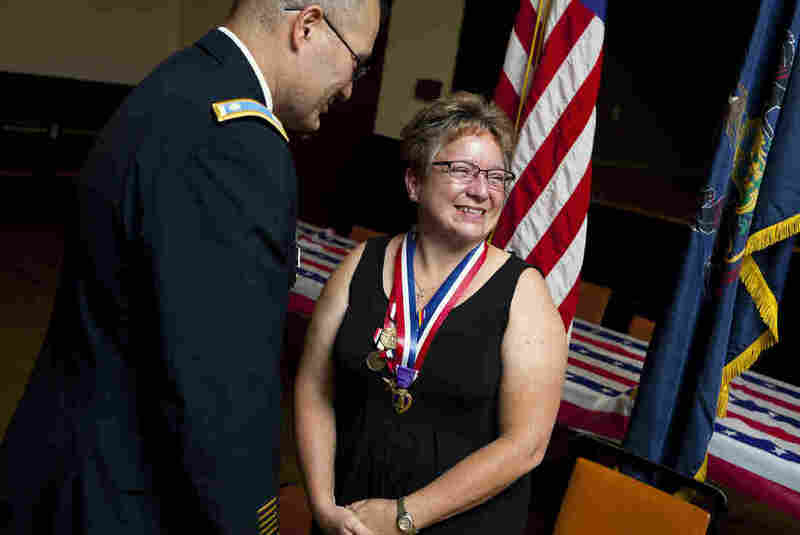 Once Denied A Purple Heart, A Soldier Gets Her Medal The Army changed its guidelines last year on awarding Purple Hearts to troops who got concussions in combat. NPR and ProPublica reported on this two years ago, and last month, one of the soldiers profiled by our investigation — who had been denied a Purple Heart — finally received her medal. In 2010, NPR reported that some Army commanders refused to award the Purple Heart to many troops who got concussions in combat because they didn't consider these "real" injuries. As a result of our story, the Army did its own investigation and put out new guidelines on Purple Hearts. Last week, the Army told NPR that under the new rules, they've finally awarded the medal to almost 1,000 soldiers, including Michelle Dyarman, whom we profiled in our original 2010 reports. Michelle Dyarman is at the American Legion on a recent Sunday more than two hours before the ceremony is supposed to begin. Her local American Legion is in a drab brick building in Hanover, Pa. They've set up three long folding tables in the social hall, covered with red, white and blue plastic tablecloths. There are platters with cubes of salami, cheese and vegetable dip. Dyarman keeps tearing up and wiping her eyes. "It's a big day," she says. She has set up poster boards on a side table with mementos and photos from her Army career. Her Army cap, her Army boots — they're tiny, like they belong to a kid. One photo shows Dyarman with a group of Iraqi children around her. "We were delivering shoes and school supplies, and toys, clothing, food," she says. Another poster features pictures of her and some of the famous people who visited Walter Reed Army Medical Center while she was there — including President George H.W. Bush and Tom Hanks. Dyarman, a major in the Army reserves in 2005, had been setting up meetings around Baghdad between Army commanders and Iraqi leaders. A roadside bomb exploded right beside her Humvee. A few months later, she was in a second explosion. The Army sent her to Walter Reed to treat her paralyzing headaches, muscle spasms and post-traumatic stress disorder. Army commanders did not give the Purple Heart to Dyarman. In fact, our investigation with ProPublica showed that some Army commanders and even doctors belittled concussions, which are also called mild traumatic brain injuries. They shrugged off concussions as phony injuries. To the contrary: Army regulations have said for decades that a concussion is just as much an injury as bullet wounds or the effects of poison gas. Most people who get concussions seem to recover, but studies suggest that maybe 5 to 15 percent don't — like Dyarman. She says she's not back to normal. "I can't remember things, I have trouble finding the right words," she says haltingly, and then struggles to finish her thought. She says as long as the Army kept denying her Purple Heart, it was like telling her, "You're making it up." One of Dyarman's fellow officers back in Baghdad was Lt. Col. Roger Peterson, now retired. He flew here from California, on his own dime, because he wanted to be part of this day. He says Dyarman has changed a lot since Iraq. "She used to be real cheery. She was right on the ball. She was a very sharp, intelligent person. Her memory, and her focus, her energy, have all changed. And this has all been since the blast," Peterson says. He says he tried over and over again to get Dyarman the Purple Heart, and has a 3-inch pile of applications and rejections. But then, the Army put out its new guidelines last year. They publicized the guidelines in newspapers, on Pentagon TV and on Soldiers Radio News. 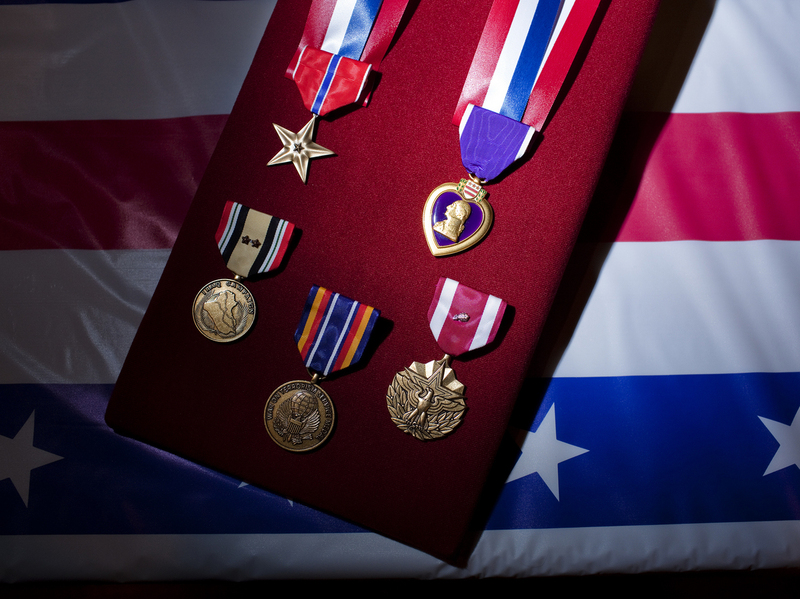 Dyarman's Army medals include a Purple Heart, Bronze Star and a service award for more than 26 years in the Army. The guidelines are dry and technical. But they say to commanders, in effect: If troops got diagnosed with a concussion from an enemy explosion, and they got treatment — even if that treatment was a pain pill — then they deserve the Purple Heart. A veteran's advocate helped Dyarman apply another time — her fifth time. A couple of months ago, Dyarman opened the mailbox at the family farm where she lives with her father. There was a big yellow envelope from the Army. She figured it was another rejection. "So I actually didn't open it right away, and when I did open it, I was shocked," she remembers. She showed her father the letter as soon as he got home from work. "He gave me a big hug, and we both cried," she says. The Army sent three representatives from Carlisle Barracks in Pennsylvania — one of the oldest bases in the country — to Dyarman's ceremony. More than 30 of Dyarman's family and friends sat quietly at the folding tables. Dyarman stood in front, next to the American flag. Lt. Col. Ralph Perkins, chief of the Army Awards and Decorations Branch, says that since the Army put out the new guidelines last year, they've awarded 976 Purple Hearts to soldiers and veterans like Dyarman who suffered mild traumatic brain injuries. They've turned down only 31, and a few hundred more are still in the works. "The big message I would say is that the Army understands this is an injury. Commanders are more aware [that] in cases where a concussion or a mild traumatic brain injury has occurred, Purple Hearts are being awarded based on that," Perkins says. On the other hand, studies suggest that tens of thousands of troops got concussions in Iraq and Afghanistan, so it looks like only a fraction of them have applied for Purple Hearts under the new guidelines. Perkins says he doesn't know why. Veterans advocates say that maybe most of those soldiers never got an official diagnosis, or maybe they don't know about the new guidelines. Or maybe they know about the guidelines, but they don't have the will to go through the red tape. Perkins says veterans should just write or call his branch, and somebody will help. "And we're going to do everything in our power to possibly issue in those potential cases," he says. He's encouraging veterans who got concussions and don't have a Purple Heart to apply. Back at the American Legion hall, Dyarman is still standing beside the American flag. People keep coming up and hugging her, praising her, congratulating her. Finally, Dyarman wants to go to the buffet table. Her guests have already started eating the chocolate cake. It's decorated, naturally, like the Purple Heart. Part of the official Soldier's Creed is, "I will never leave a fallen comrade." Dyarman says that ever since the Army first rejected awarding her a Purple Heart, she has felt that she "was kind of left behind." "Somebody finally stepped up and picked me up, and made things right," Dyarman says. "And for that, I'm very grateful."